Since 1997, Hector’s Restaurant has been tempting your taste buds and spicing up your life with the most amazing authentic Mexican cuisine! We are the only restaurant that specializes in Baja style cooking in the region. Every day it’s ‘viva la fiesta’ with the best Mexican menu and margaritas in town! Our food is prepared fresh every day. That includes our entrees, beans, rice, salsa and no doubt, our guacamole! Our famous Margarita can be blended or on the rocks, and if that’s not what you’re in the mood for, we have a large assortment of domestic and imported beers. 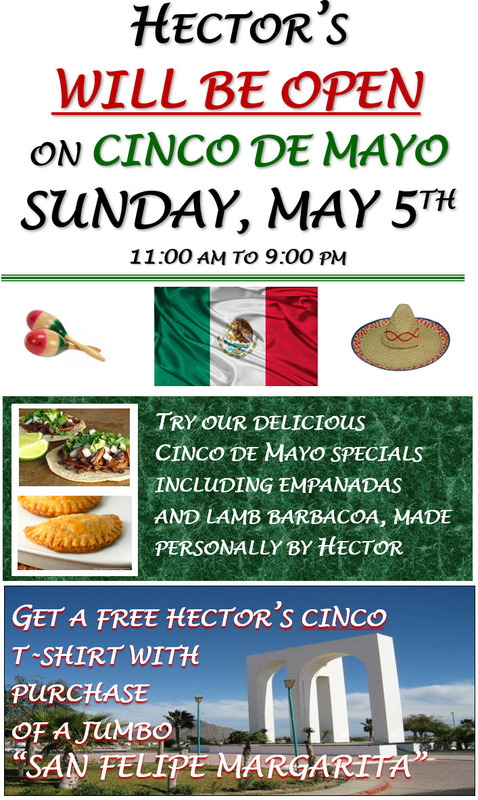 Whether you’re out to dinner with the family, enjoying a drink with friends, or planning an event, Hector’s Restaurant looks forward to serving you. We sincerely appreciate your business and hope that we will continue to deserve it in the future!